Coconut palms can be grown from seed, though most are purchased as juvenile trees from nurseries and transplanted. The early years are critical for getting the tree well established to anchor it well. Developing a healthy root system is critical to tree's long-term health and stability as it reaches full height. Getting the tree established requires one type of fertilizer program, while maintaining the tree requires a different fertilizer program. 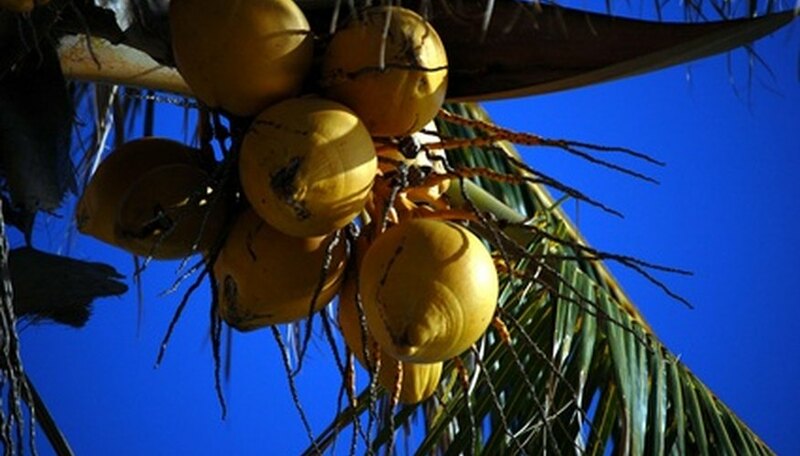 Coconut palm trees produce large green leaves that require extra nitrogen.To provide the nutrients needed to achieve this type of growth, a granular fertilizer with a 2-1-1 ratio of macroelements should be used, according to the University of Florida's Extension Office. The fertilizer should contain both slow-releasing and fast-releasing nitrogen. This gives the palm tree a feeding of nitrogen quickly to help stimulate immediate growth and a slow release that the roots can access as they develop. When coconut palms are shipped from nurseries, their roots are more compacted than a naturally grown coconut palm tree. They are often inadequate to take in the nutrients the tree needs as a result of this compaction. These roots need to develop during the first year following planting. They need time to spread out and gain strength before they can adequately support the tree which can reach 80 to 100 feet at maturity. Fertilizing young trees is done with foliar fertilizers. Foliar fertilizers allow the leaves to absorb the nutrients. Soluble fertilizers are sold as either macroelements or microelements. Macroelements are nitrogen, potassium and phosphorus. Microelements are manganese, molybdenum, boron, iron, zinc and copper. It is possible to buy both and combine them before spraying the coconut tree. This method also requires the use of a wetting agent which helps the fertilizer get passed the waxy coating of the coconut palm’s leaves. If the fertilizer does not contain this, you can add three to five drops of liquid detergent to every gallon of mix you apply. Foliar fertilizer should only be applied when weather conditions will be dry for 24 hours. If rain occurs, the fertilizer will need to be reapplied. The applications should be made at regular intervals of every one to three months. A monthly application is recommended by the University of Florida Extension Office. If it is not practical to apply every month or weather prohibits an application or two, it won’t harm the tree. Try not to go longer than three months between applications. After the first year, coconut palms no longer need foliar fertilizer. At this point, granular applications, still using the 2-1-1 ratio, are adequate. Intervals for application extend to three to four months apart. This continues until the tree is older and well established. Then applications can be made twice a year, in the spring and the fall.